The face, wrinkled and wise, looks at our boat for a few moments. Our small group rushes to starboard to snap photos and get a better look. But the creature, shrewd beyond her many years, dives back into the depths, her face and shell disappearing promptly into the aquamarine depths of Danger Reef. Danger Reef, a diving site, popular with both turtles and people, apparently owes its ominous name to the large population of sharks that live here. A few tight circles on board the 35-foot Intrepid At Least (tender to the yacht At Last) and handfuls of shrimp and bologna bait rouse the ­impressive fish from the bottom. Soon, dozens thrash near the surface, fins, tails and snouts close enough for daring hands to reach out and touch them. It is as if the sharks were waiting. A buoy marks the diving site and, more often than not, boaters suit up and dive in after the sharks swimming in water less than 60 feet deep. In July 2011, the Bahamas banned shark fishing, effectively creating a haven for the more than 40 species that inhabit Bahamian waters, including the sharks of Danger Reef. As we leave our mooring and head back to the mother ship, a speeding boat seems intent on intercepting us. 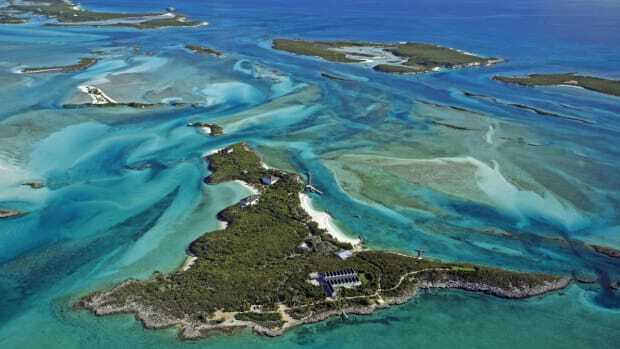 Visions of the pirates that used to roam these parts may come to mind, but since we are close to the Exuma Cays National Land and Sea Park, our visitors most likely are from park headquarters. The center-console boats pass each other at low speed and the patrolmen exchange pleasantries with our skipper, whom they recognize from other charter trips this season. Reassured that we have not violated any rules, the park warden flashes a smile and waves as he speeds away, white foam trailing his outboard motors. 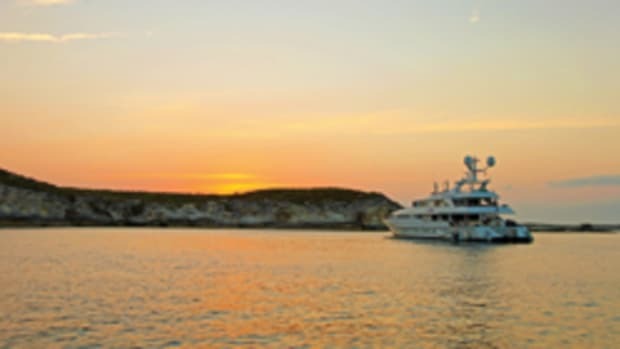 The northern end of the Exumas chain is only a five-hour cruise from the capital island of Providence, but its string of some 365 islands and cays, largely inhabited, offer exotic ­adventure and incredible beauty. My traveling companions are seasoned travelers who have seen the best spots from the Med to Polynesia. Yet, the startlingly vibrant turquoise sea streaked with milky white and emerald ribbons elicit oohs and aahs even from these pros. When the sun shines upon them, the Exumas’ azure waters are incomparable. On a clear day, they are visible from thousands of feet up, a recognizable landmark on a transatlantic flight, but this rich and diverse playground is best discovered aboard a boat. 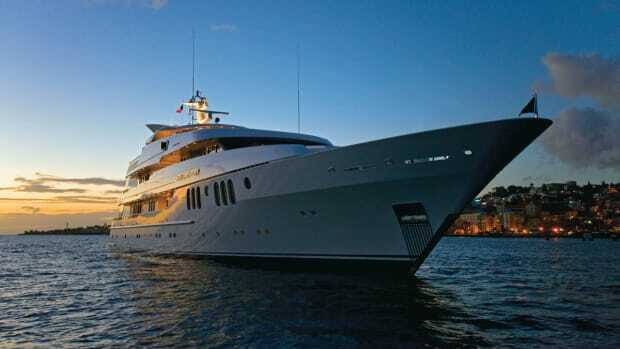 And a crewed charter yacht is better yet, which my experience as a pampered guest aboard At Last reminds me. The 145-foot (44-meter) Heesen, well suited for the shallow waters of the Bahamas with a big aft deck dedicated to watersports, is part of a flotilla of charter yachts that frequently cruise the area. 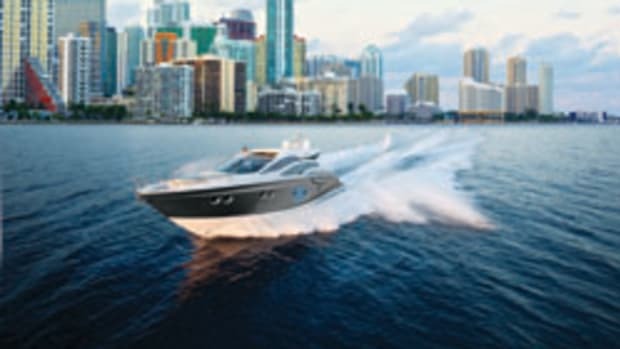 Along for the trip by invitation of the Florida Yacht Brokers Association are host yachts Tuscan Sun, Big City, Independence 2 and Hooter Patrol 4. 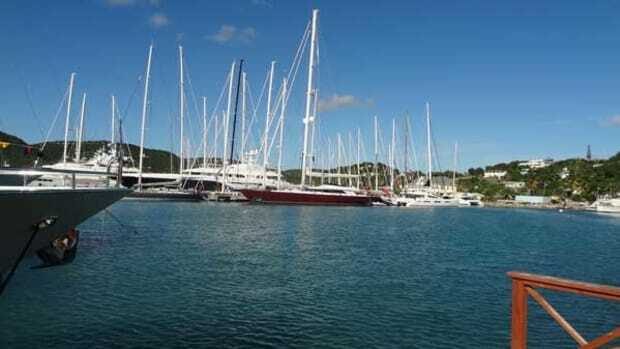 The yachts are all very different but their experienced captains have something in common: They know the best beaches, the best dive sites and the most beautiful moorings. 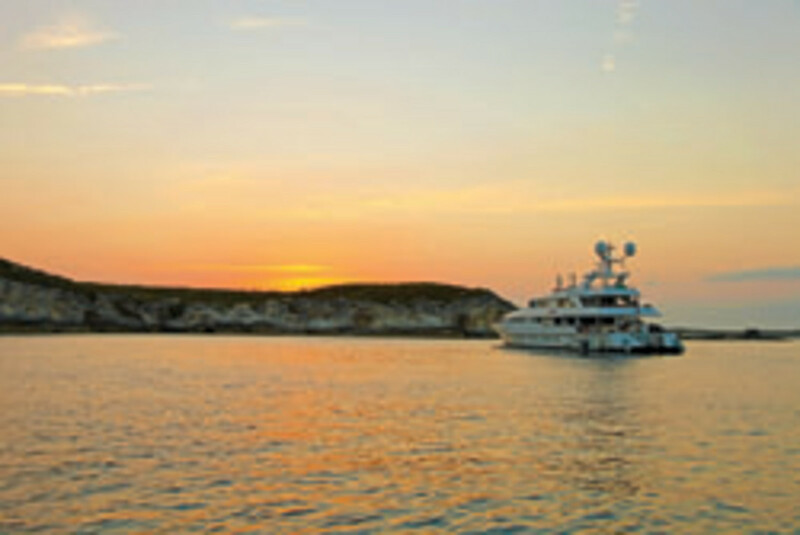 The yachts all have great tenders, speedy and able to reach secluded beaches that can host fantastic parties. So, although we only have four days to explore, including the half-day journey from Paradise Island and nearly full-day return to Providence from Norman’s Cay, it is enough to get a taste of true Bahamian adventure. This trip took place in early April—a very nice time of year to explore the Bahamas. The waters are calm and warm enough to swim and snorkel comfortably. While the Exumas have secluded beaches, easy hikes and a smattering of lovely and laidback resorts, the islands’ limpid waters remain the main attraction. In nature, beauty often comes from decay, and the Bahamas owe their beautiful beaches and caves to erosion. Rainfall over the millennia wore down the top of ancient coral reef formations that comprise the archipelago, breaking them down into the finest sand and creating shallow caves opened to the sky. Thunderball Grotto, near popular Staniel Cay, is one of the Exumas’ most famous caves. After a movie scout happened upon the site one day, it turned up in a few films, including two James Bond flicks. Entering the grotto requires a mask, snorkel and a strong kick, but it is an easy swim after that. Once through the threshold, the current takes over, which allows swimmers to simply drift, looking at purple swaying fans and fish moving in unison in the clear surf. 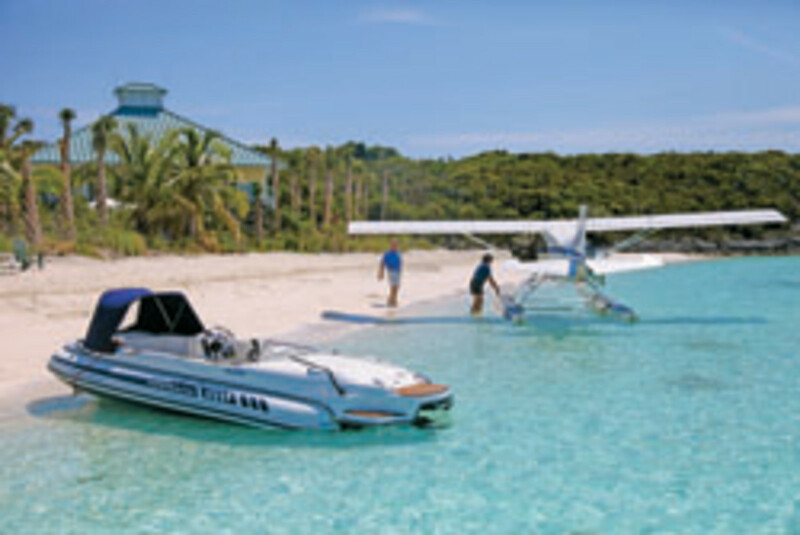 A knowledgeable guide or yacht captain can take you to many other similar sites throughout the Exumas. 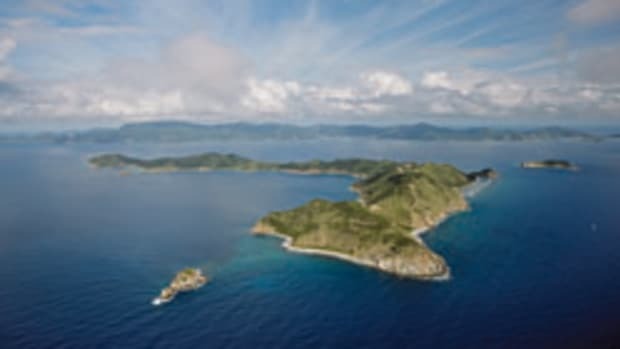 And it is clear from the number of boats and yachts we spot along the way—including a 282-foot ­superyacht seeking privacy behind a small cay with nary a tree—that the popularity of the Exumas is growing. Like the sharks on Danger Reef, the swimming pigs near Staniel Cay seem to wait for visitors they know will bring their next meal. They are sometimes said to be descendants of pigs brought by the Spaniards centuries ago, but who knows? The history of the Exumas is as full of holes as the caves themselves. 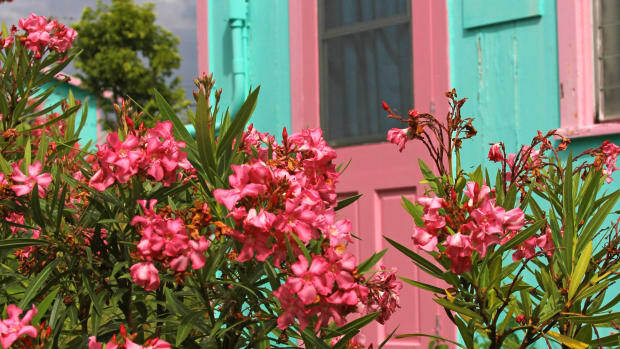 The Exumas get their name from Yumey and Suma, words derived from the language of the ­Lucayan Indians (not Spanish). The names showed up on early maps drawn by Spanish explorers. But while Columbus made landfall somewhere close to what is now known as San Salvador farther south and eventually claimed the Bahamas for the Kingdom of Spain, he personally did not come close to this area. In the 17th century, English settlers were granted farming rights on Hog Island and Great Exuma and could conceivably have brought animals. Whatever their ancestry, the swimming pigs can be a bit temperamental, but they are far from feral. They swim right up to the boats, snouts at the ready to assess the latest offering of lettuce and table scraps from visitors. Many of the boaters meet at the end of the day at nearby Staniel Cay Yacht Club, trading stories over Kalik beer, a light local brew. The colorful bar shares space on the island with a small airstrip, quaint homes and a dock facing the sunset. Dogs of unknown origin run around freely, as a band plays for an appreciative crowd. Whatever stress you may still hold onto melts away as the setting sun paints the watery horizon crimson. The 130-mile-long archipelago offers plenty of opportunities to mellow out. 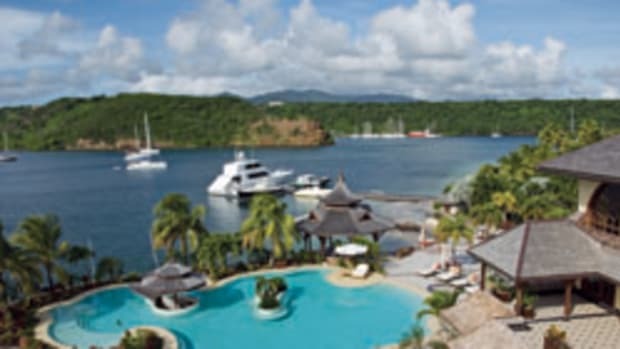 Like Staniel Cay, Norman Cay, the former haunt of the infamous ­Medellin Cartel drug lord Carlos Lehder is well known and attracts visitors year-round. One of the attractions is a drug-runners’ plane, which sank in a few feet of clear sea. It has since become a favorite diving site attracting snorkelers and barracudas. What remains of the cockpit serves as a perch for sea birds at low tide. But other cays are wilder and lesser known. What most visitors appreciate is the islands’ diversity. 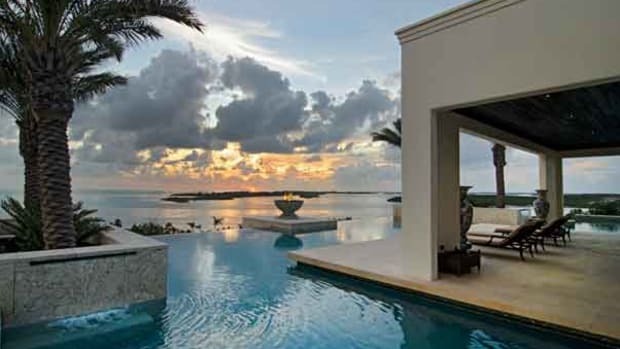 “The Exumas are the best. Depending on what someone wants to experience, there are so many places to go,” says At Last captain Herbert Magney. The charismatic captain, a hospitality pro landside and on the water, joined At Last when it became available on the charter market after an extensive refit that gave it a new and comfortable interior—including deliciously comfortable beds. Equipped with waterjets, At Last has a draft of less than six feet, which grants it access to areas that are forbidden to deeper vessels. It can, for instance, cut straight across the shallow Bahamas banks from Paradise Island, while other boats—including sailboats—may prefer, or be required, to take a more circuitous route. Our first night is spent alone near a pristine cay. At night, the celestial vault, sprinkled with myriad stars, is reflected in the inky sea lapping at the hull. In the morning, several of the guests rise early to go fishing and diving. They board the 32-foot Intrepid that Tuscan Sun has sent to pick them up, but I choose to stay aboard for a delectable breakfast served on the aft deck. It’s a spectacular day. Flying from their nests hidden in the crevices of limestone walls, white-tailed tropicbirds perform an aerial ballet. The birds, easily recognizable thanks to their graceful trailing tails, are there from March to August. We are close to Shroud Cay, a limestone island surrounded by rich waters and shallow mangroves that serve as a nursery for conch and crawfish (and buffet for the seabirds). That’s the Exumas for you. Yumey and Suma. Within a few miles you can experience everything from the wild to the serene, socialize with like-minded friends in popular marinas one night or be perfectly alone and at peace communing with nature the next. And this great diversity is all within easy reach.